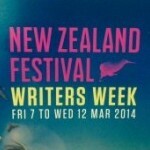 Unity Books (us) is happy to present (to you) our newsletter for this years New Zealand Festival Writers Week. We will be on site at all events to provide you with easy access to the sweet nectar of fiction, poetry, non-fiction, non-poetry, picture books, graphic novels, and essay collections that make up the collected work of this years guest writers. Take a look by clicking on the image below, and if you’re still wondering what juiced-up literary events the festival holds for you, follow this link to the festival’s website.